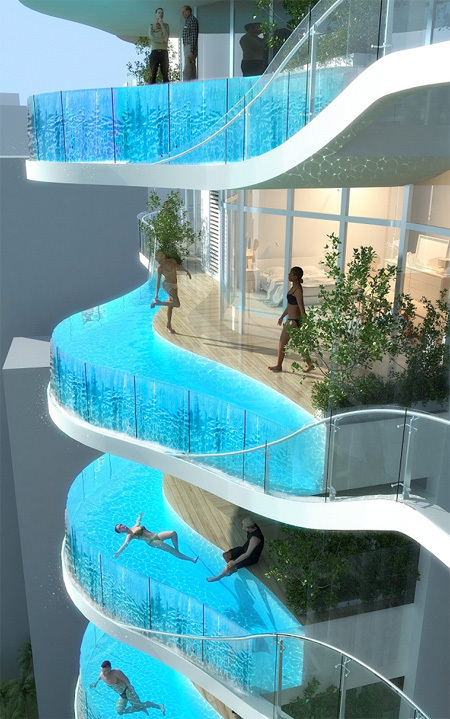 Bandra Ohm residential building in Mumbai, India will feature large balconies with integrated swimming pools. 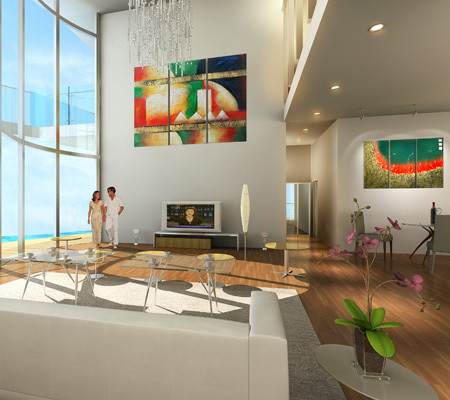 Designed by world renowned architect James Law, modern apartment building was inspired by the ripple effect and the symbol Ohm (Ω). 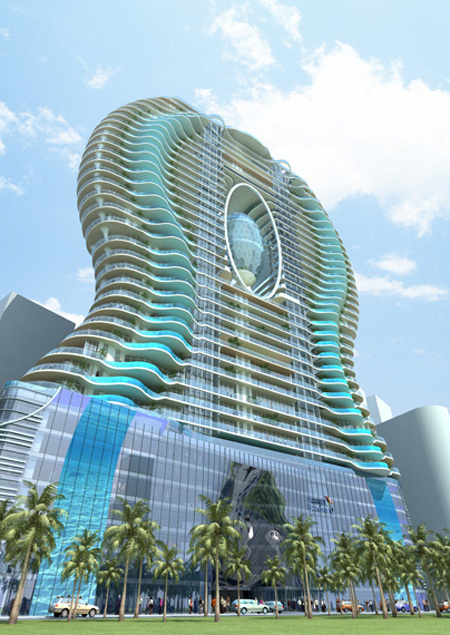 Proposed 30-story tower with swimming pool balconies aims to provide luxurious and comfortable living environment. When I stand on a regular balcony, I know that if the rails break, I’ll have time to respond. Here, if the rails break, I’m going to be washed off the balcony. I’d be a nerve wreck. It’s pretty but I think I’d be terrified to swim in it. Fun when you JUMP in, you feel the splashes from 300 meters above you, that hurts! Terminal velocity, knucklehead. Rain doesn’t hurt for the same reason. i’m more interested with the big egg shaped crystal in the middle. even the top could open…wow…..what is that????? could the thing in the middle be blitzball from final fantasy? 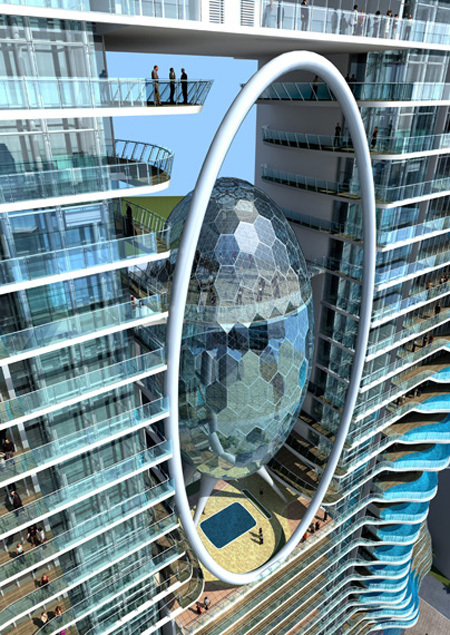 the egg, maybe just hall covered by solar panel. Maybe we should start taking natural disasters serious and considering them them building. The design is neat, but I’d be nervous as well. no architecture i can identify with. 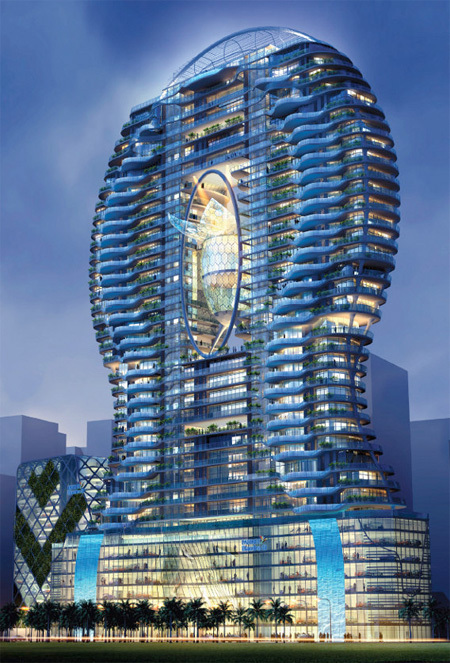 i hope it wont ever be built! It’s completely remarkable, breath taking, and amazing. How relaxing and peaceful it would be to be standing in the water glazing over the side on a nice summer night. I could only dream of the moment. There’s no way in hell this would work. Structurally, it’s suggesting about a 12″ cantilever slab that spans about 30 ft with no supporting columns. On top of that it’s supposed to support a pool full of water. Impossible. For this to even be considered it’d need support columns on the outside by the pool that could distribute the load down. The big center room could not be that spacious and would need several columns to shorten the span length that supports the upper floor and pool. Sure, architects can draw some pretty buildings, but they often overlook the reality of constructing such building. 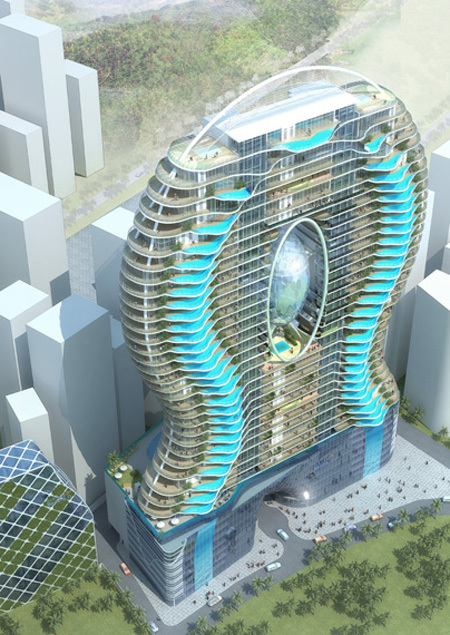 k, @Kris, this is not just some drawing, this is an actual building in India that people do go to and stay at. So you say impossible I say possible because its real and not some fake drawing or idea. Why do people say this is impossible just because they don’t understand. You know, like telling a bumblebee it can’t fly because it’s aerodynamically impossible. But the bee doesn’t know this, so it flies anyway. This is amazing and beautiful. Wish I could stay there!